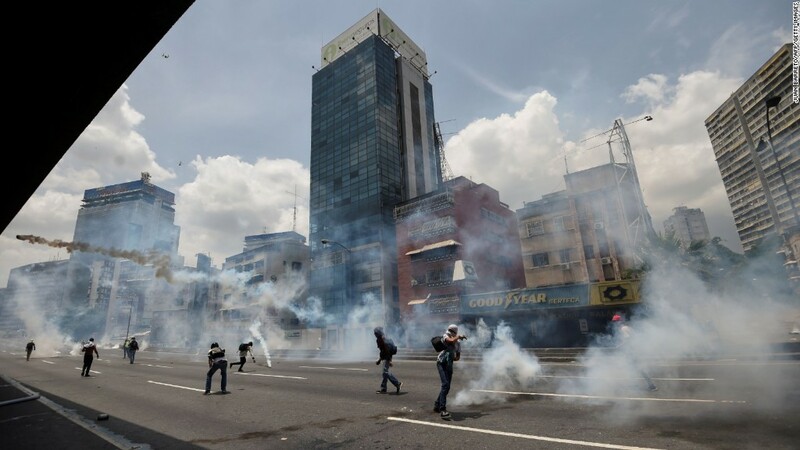 Venezuela is diving deeper into crisis as its citizens continue massive protests against President Nicolas Maduro and major companies are pulling out of the country. On Wednesday, three people were killed in violent anti-government protests across the country. Later that day, the government also seized General Motors' plant in Venezuela. The company immediately shut down its operations there. Other major corporations, like Pepsi (PEP) and Delta (DAL), had already either written off or dramatically cut down operations in recent years. The country's malaise of crises stem from the socialist regime that's largely created an economic crisis. On Tuesday, The IMF didn't sugarcoat its updated economic outlook for Venezuela. "Venezuela remains mired in a deep economic crisis," IMF authors wrote in its World Economic Outlook. Unemployment is set to surpass 25% this year, possibly on its way to 28% next year. It was at 7.4% in 2015. Venezuela's economy shrank a massive 18% last year -- its third year of recession and it's expected to be in the red this year, and next too. The IMF's prediction for inflation in Venezuela is pretty bad, but better than previous expectations: It's expected to skyrocket 720% this year -- somehow only half of the previous forecast. But if Venezuela stays on its current path, the IMF predicts inflation will rise over 2000% in 2018. Protesters have taken to the streets in recent weeks after Maduro's administration barred opposition leader Henrique Capriles from holding any political office for the next 15 years. More protests are planned in the coming days. Venezuelans have struggled for years with food and medical shortages, and -- more recently -- skyrocketing prices on all types of goods, as hyperinflation wipes out salaries and the value of the currency, the bolivar. They have demanded Maduro step down as any signs of democracy have washed away. His loyalist-backed Supreme Court tried to strip the opposition-led National Assembly of its powers, but quickly reversed course after severe public outcry. The Supreme Court has blocked all reforms from opposition lawmakers. Maduro is facing pressure from overseas too. President Trump tweeted in February that Maduro should release his biggest adversary from prison, Leopoldo Lopez, who has been in jail since 2014. The US has also slapped sanctions on Maduro's vice president, Tareck El Aissami, for alleged drug trafficking. The Organization of American States, which includes every government in the western hemisphere, demanded in March that Venezuela hold democratic elections or face suspension from the group. Maduro's peers in Latin America -- long silent on the country's crises -- are starting to speak out too. "They are not fulfilling what we consider human rights," Argentina's President, Mauricio Macri, told CNN earlier in April. "I am really worried about what is going on."